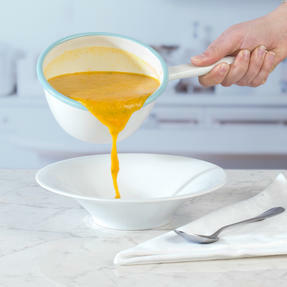 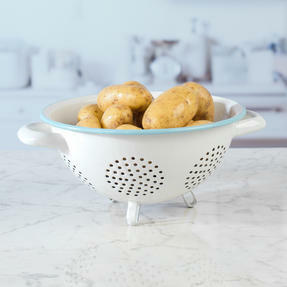 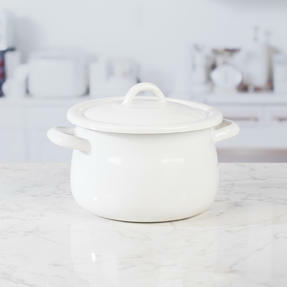 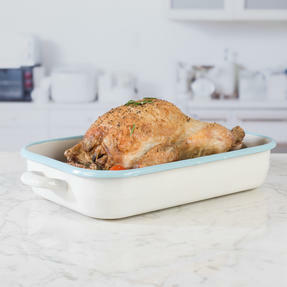 This fantastic Salter enamel cookware collection consists of a 14 cm milk pan, a 16 cm saucepan, a colander, a 16 cm casserole pan, a 22 cm casserole pan and three roasters. 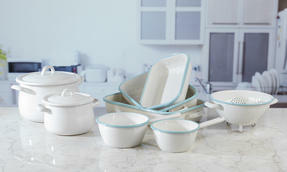 Each piece of the collection has a wonderfully stylish design and a cream exterior and an eye-catching clue rim. 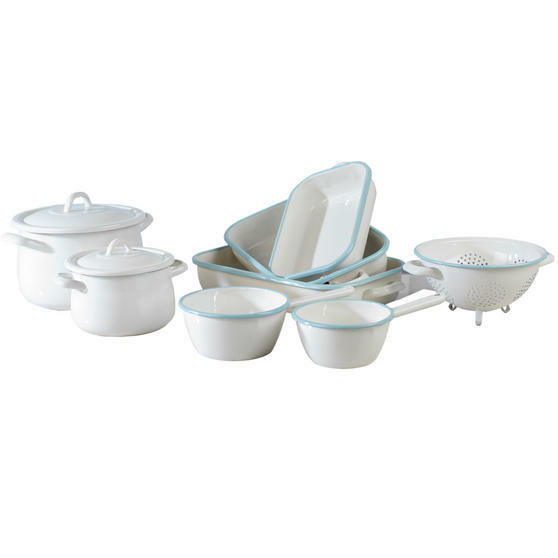 All made from steel with an enamel coating, the set will give your kitchen a retro feel. Included in this set you have everything you need to prepare gorgeous family meals or just a meal for one. 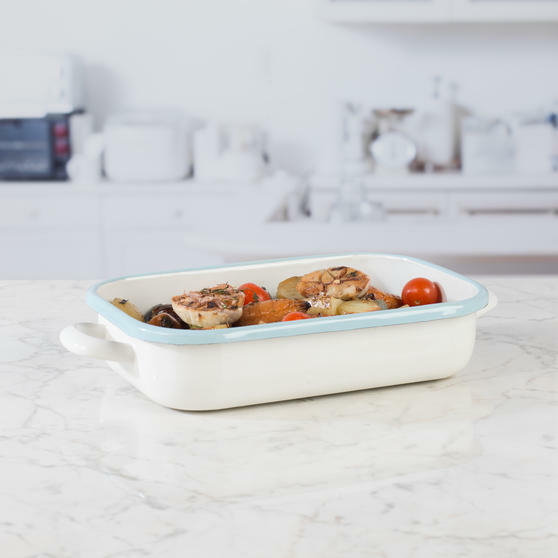 This Salter retro cookware set looks stunning in any setting and includes the kitchen essentials to combine style with practicality. 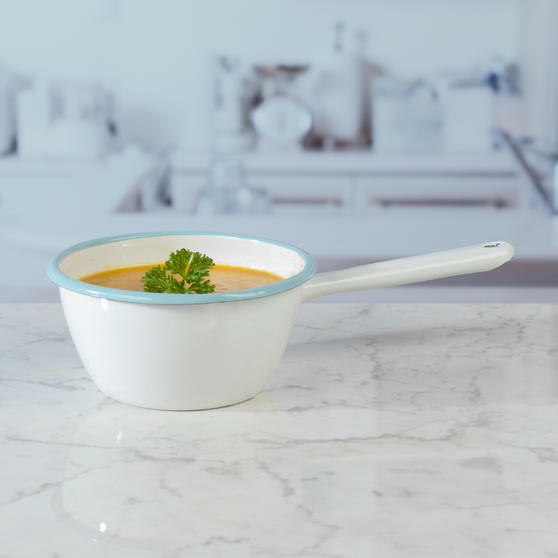 Handcrafted from steel with a fantastic enamel coating, beautiful cream exterior and an eye-catching blue rim. Each piece is made from steel with a fantastic enamel coating with a trendy cream exterior and an eye-catching blue rim. 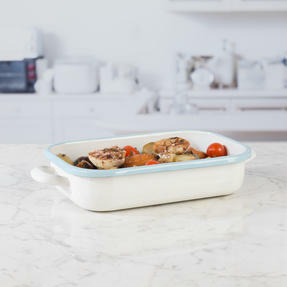 Easy to clean in hot water, the roasters and casserole pots are oven safe and the pans are suitable for all hob types except induction. Whether you are looking to kick-start your cookware or refresh your current set this retro collection is a brilliant addition.